Later in life, when posing for a portrait, Stillwell’s likeness could not be captured in a pleasing way until the artist made mention of the Dorr War. At this reference, the painter’s “subject’s blood pressure went up, his face suffused with color, a new look of determination came into his eyes. Noticing this personality change, [the artist] kept [Stillwell] discussing politics all through the sittings, with the result that in the portrait he appears as rosy and rugged as an English country squire." This location at 17 Canal Walk is the former location of Stillwell's bookstore. Old Coffee Shop: Stillwell operated his book shop in the old Coffee House in Market Square. This twentieth-century drawing depicts the building as it appeared before its demolition in the 1850s. Margaret Bingham Stillwell's Work: Abraham's granddaughter, Margaret Bingham Stillwell, worked hard to preserve the memory of not only her predecessor, but of the entire East Side of Providence. She wrote extensively about historic Providence, including her childhood spent on Benefit Street. 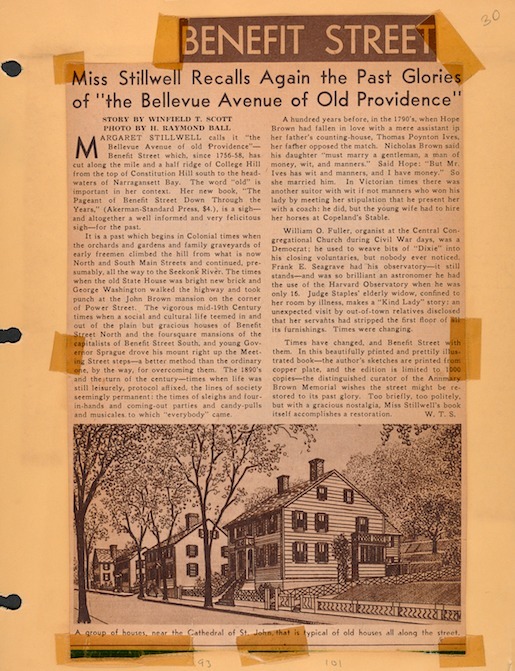 This image shows a clipping from John Hutchins Cady, noted architectural preservationist, describing Stillwell's historical efforts. 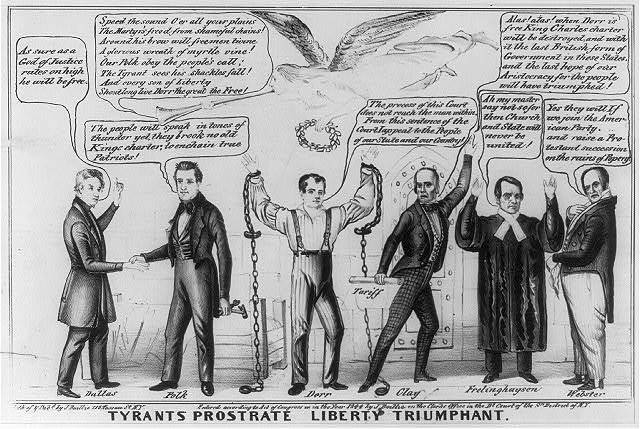 Tyrants Prostrate, Liberty Triumphant: This illustration is the kind of pro-Dorr propaganda that Stillwell would have showcased in his shop. The 1844 image was printed during Dorr's imprisonment and argues for his release. Coffeehouses in the 18th and 19th centuries functioned as community gathering places where local and national news was dispersed, and hot-button issues debated. 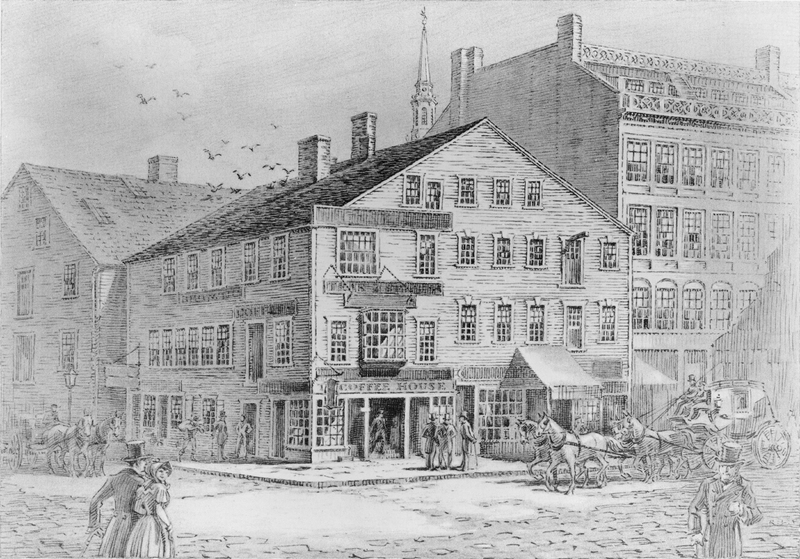 Stillwell’s adjacent bookstore, then, would have been perfectly situated to witness lively, contentious arguments in the weeks leading up to the Dorr Rebellion. Margaret Bingham Stillwell recalls that her grandfather wanted Rhode Island’s citizens to “face facts.” Other printers, from both sides of the conflict, did, too: copies of both the People’s Constitution and the Law and Order Constitution were printed side-by-side to show the supposed glaring differences. To learn more about the two constitutions, check out this lesson plan. Elyssa Tardif, “Abraham Herman Stillwell,” Rhode Tour, accessed April 21, 2019, http://rhodetour.org/items/show/231.